Refueling, hydrating and energizing are the functions most promoted on trending functional beverages in today’s marketplace. There is also a niche segment of beverages positioned as meal replacements. The primary function of the beverages is to nourish. As the name suggests, they are meant to replace a traditional sit-down meal and deliver a balanced profile of carbohydrates, fats and proteins, much like a consumer would obtain from meals developed following dietary guidelines. 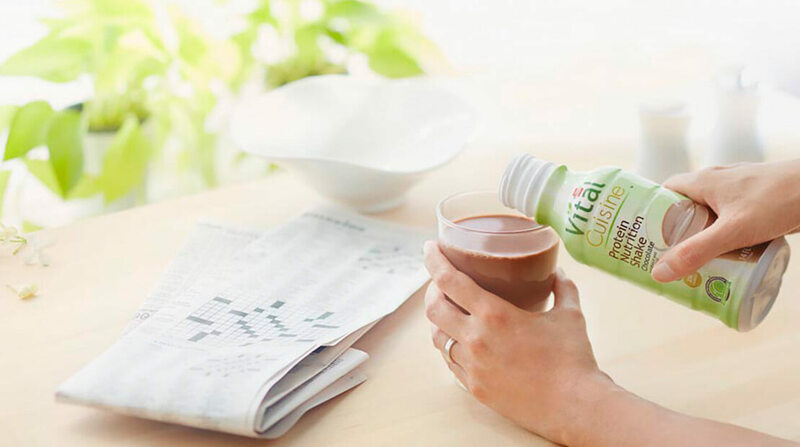 About a year ago, Hormel Foods Corp., Austin, Minn., introduced Hormel Vital Cuisine, a line of foods and beverages designed specifically to support the nutritional needs of cancer patients. The shakes were developed with assistance from chefs from the Culinary Institute of America, Hyde Park, N.Y.
Each 14-oz nutrition shake provides 25 grams of protein from an array of dairy ingredients, including caseinates, milk protein isolate and whey protein concentrate. Like many beverages designed for special medical conditions, the primary source of fat in the shakes is medium-chain triglycerides. The easy-to-digest fats do not require energy for absorption, use or storage. Get Your Guac (-amole) On! Wholly Guacamole’s Pop-Up Shop Goes Live at Americana at Brand 7/27-7/31!